Three Atlantic hurricanes threatened Charleston during the storm season of 1893. The first and third passed seaward of the city. One became known as the "New York hurricane" of August 23; the other made landfall on October 13 in Georgetown County, where more than a dozen people drowned. Notable for its force and duration, the cyclone of August 27-28, 1893, blasted the Lowcountry with a direct hit. South of Charleston, where it is remembered as the Sea Islands Hurricane, the 1893 storm brought death and near-starvation to thousands. However, it caused remarkably slight loss of life and property in the city. When storm signals were hoisted on Friday, August 25, Charlestonians felt the usual dread. The forecast in Saturday morning's News and Courier proved accurate: northeasterly wind, increasing to gales, and a hurricane center moving north. Intermittent pelting rains most of Saturday were followed by howling gales overnight, then a lull on Sunday morning. Church services went on, with light attendance, but soon "there was no longer a doubt that the dreaded cyclone was to descend upon the city in all its fury. The craft lying at anchor in the bay were first to take alarm, and from all quarters of the harbor they came hurrying in." Torrents of rain worsened as evening approached. All of the city south of Calhoun Street lay under a sheet of water, which stood three to five feet deep below Tradd Street. The Western Union office failed about 3 o'clock Sunday afternoon. The last telegraph out of Charleston read: "The gale is severe. Reported that Sullivan's Island has been swept over by a tidal wave and completely submerged." The eye passed late in the day, and the water rose another five feet. At 8 o'clock the west section of the city was six to ten feet under water; at 11:00 PM the tide was six to eight feet high over the East Battery. Behind the eye, the worst of the storm blasted across town around 1:00 AM on Monday, August 28. Near dawn the weather began to calm; by noon it had cleared enough that people emerged and began to assess the damage. "The sight that met their gaze was strikingly familiar. A city almost in ruins…"
Docks and wharves on both waterfronts had been smashed, and vessels of all kinds lay wrecked or stranded. 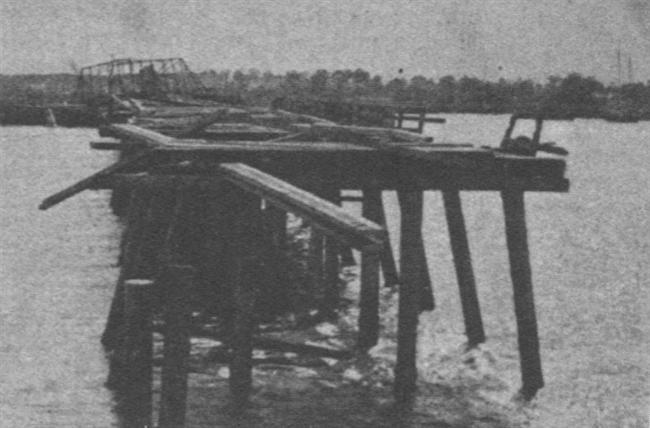 A single pier on the Cooper River, the stone construction at the Customs House, was in usable condition. The East Shore Terminal Company suffered the heaviest losses. Twelve of the firm's fourteen piers were destroyed; only the wharves used by Clyde Steamship Company were insured. The "magnificent promenade known as the High Battery," was torn to pieces, its huge paving stones tossed into the street. At the west side of the city, the drawbridge across the Ashley River dangled from its mutilated support structure. Both causeways were washed out, hundreds of feet of wood planking swept away. Wharves and storehouses at the West Point Rice Mill were badly damaged, and the bathing house off White Point Garden had disappeared completely. 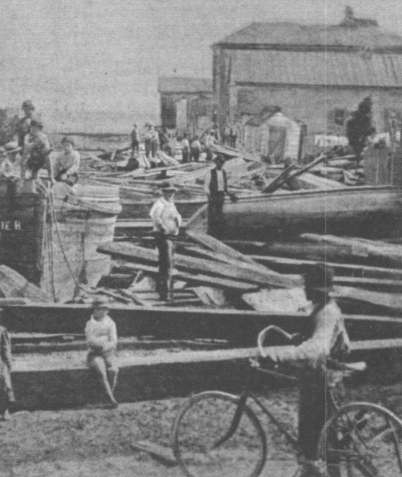 The waterfront destruction proved the force of the storm, but in general there was less damage to buildings and loss of life (three dead in Charleston, three on Sullivan's Island) than the 1885 cyclone had caused. The News and Courier attributed the difference to the "extensive and solid repairs of all classes of buildings, and especially of roofs," that had been made following the 1885 storm and 1886 earthquake. Armies of laborers began to repair buildings and roads once more, and as early as August 31, the newspaper informed the world that "Charleston wants it distinctly and emphatically understood that she is ready and anxious to do whatever cotton or other business is sent here." 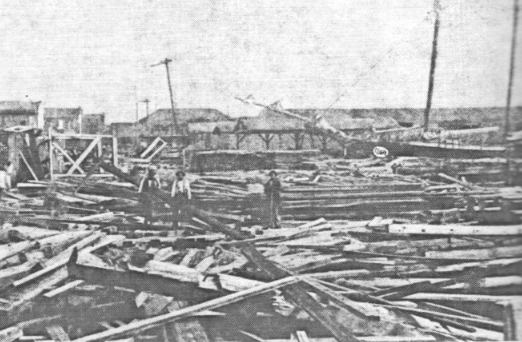 The hurricane of August, 1893, inflicted heavy damage in Jacksonville, St. Augustine, and Brunswick. Savannah was devastated. Buildings and roads were torn up throughout South Carolina's Lowcountry, and across a great swath of the interior. But the worst human suffering - thousands of deaths; loss of shelter, animals, and crops - occurred among African Americans on the Sea Islands and neighboring rural areas. As soon the storm passed, despite worries about the economic impact of the wasted rice and cotton crops, Charlestonians took consolation that so few had been killed. But while "the citizens have settled down to the task, to them familiar, of repairing the wounds of the dear old town … the death roll on the sea islands seems to be growing appallingly, and it is greatly feared the end is not yet." Telegraph lines still down, word of the fearsome destruction on the Sea Islands reached Charleston August 30, when several men who had gone to Port Royal or Beaufort before the hurricane came home, bearing reports of dozens of people drowned on the rural islands. On August 31, Governor Tillman returned to Columbia after a visit to the Chicago World's Fair. The telegram he received from J. H. Averill, a railroad official in Yemassee, shattered any remaining complacency. "The loss of life on the islands adjacent to Beaufort and Port Royal will number not less than 600 people. There are 7,000 people on the islands entirely destitute of provisions, all they had being washed away and their crops entirely lost." Tillman's immediate proclamation entreated "the length and breadth of the State to come to the aid of their suffering fellow-citizens." Then Robert Smalls, the collector of the Port of Beaufort (and former Congressman), appealed to the entire nation: "We earnestly ask for aid in feeding and clothing the hungry and naked." With houses gone, animals dead, food ruined, the scattered rural population, most of whom were African-Americans, had no money and no access to credit. Their only means of employment, farming and phosphate mining, would be impossible for the foreseeable future. Responding to the appeals, Mayor John F. Ficken called a public meeting for September 2, 1893. A "large number of representative citizens, all colors, assembled in the city hall." Fifteen hundred dollars was pledged to help Beaufort's sufferers, and there were large contributions of food and clothing. The first relief train left the same afternoon. Officialdom began to "entertain serious fears" when new messages warned not only of death and starvation, but also sickness - the first signs of contagious fevers spreading through clogged ditches, decaying vegetation, and drowned animals. Governor Tillman sent physician J. W. Babcock, the superintendent of the state lunatic asylum, to assess the situation. Returning September 7, Babcock confirmed that people were beginning to starve, and insisted that voluntary efforts were inadequate. In response, Tillman wired Mayor Ficken of his plan to base a central relief committee in Charleston, its work projected to last many months. A nationwide plea for funds went out from the governor's office. On September 18, Governor Tillman and his relief committee met with Clara Barton and her staff at the Charleston Hotel. The local group formally requested the Red Cross Association to take charge of the relief work. Logistics settled, on November 11 Miss Barton and four others arrived in Columbia en route to Beaufort. Headquartered in Beaufort, the Red Cross defined its field of service as the area below the Charleston to Savannah Railway line, extending as far north as John's Island. Agents raced the winter to dole out warm clothing sent from the north, organized and paid laborers to clear ditches and fields, and distributed agricultural supplies. After ten months of work, the Red Cross announced on June 8, 1894, that its representatives "will withdraw from the field this week and return to Washington." "Death and Disaster." News and Courier, August 26, 1893. "At the Mercy of the Storm." News and Courier, August 28, 1893. "The Story of the Storm." News and Courier, August 29, 1893. "Getting Along Nicely." News and Courier, August 31, 1893. "The Fin de Siecle Cyclone." News and Courier, September 1, 1893. "600 Lives Lost. Seven Thousand People Totally Destitute." The State, September 1, 1893. "Brave Old Charleston." The State, September 4, 1893. "Starving! Twenty Thousand Sea Island Sufferers." The State, September 8, 1893. "Red Cross to the Rescue. The Work of the Relief on the Islands." The State, September 19, 1893. "Red Cross Representatives." The State, November 12, 1893. Jesunofsky, L. N. "Notes on the Cyclone of August 27-28, 1893." Year Book - 1893. City of Charleston, So. Ca. Charleston, 1894. Marscher, William, and Fran Marscher. The Great Sea Island Storm of 1893. Macon: Mercer University Press, 2004. Harper's Weekly, September 16, 1893: "Atlantic Wharves, Charleston." The scene at Atlantic Wharf was typical of the entire waterfront. 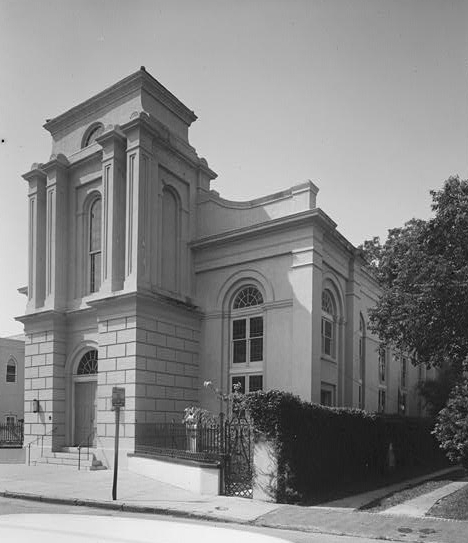 Mount Zion A.M.E. was the most seriously damaged of all Charleston's churches. The roof was crushed and both side walls broken, with damages estimated at $35,000. Neither the building nor its ruined organ was insured. Nevertheless, on Sunday, September 3, 1893, the congregation joined the citywide effort in making a special collection to aid the people of the Sea Islands. Harper's Weekly, September 16, 1893: "Council Street, Charleston." Harper's Weekly, September 16, 1893: "New Bridge, Ashley River, Charleston." James L. Jones, assistant bridge keeper, remained at his post in the keeper's house all night. He reported that three schooners, a barge, and the pile driver Maud S had all collided with the bridge. 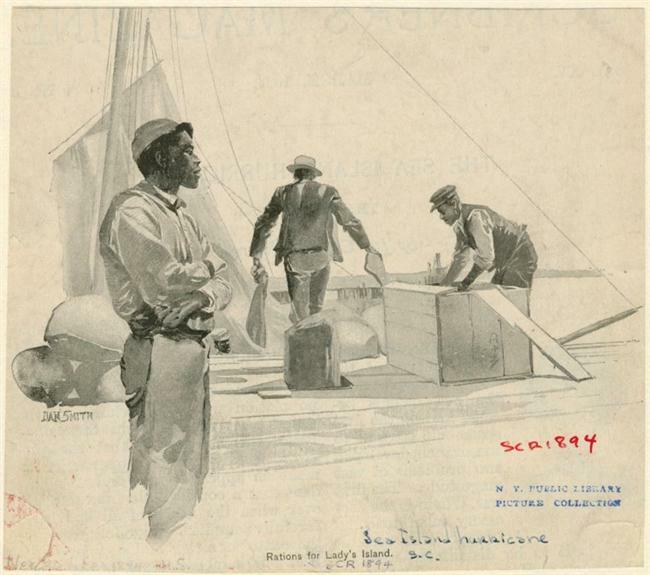 “Rations for Lady’s Island.” Scribner’s Magazine, 1894.